If you were scared off by Microsoft’s licensing program announcements last year, it may be time to take another look. Come September, Microsoft’s Licensing 6.0 will look a lot different. That’s when Microsoft plans to add a bunch of freebies to Software Assurance, the controversial centerpiece of the Licensing 6.0 program that fully went into effect in August 2002. 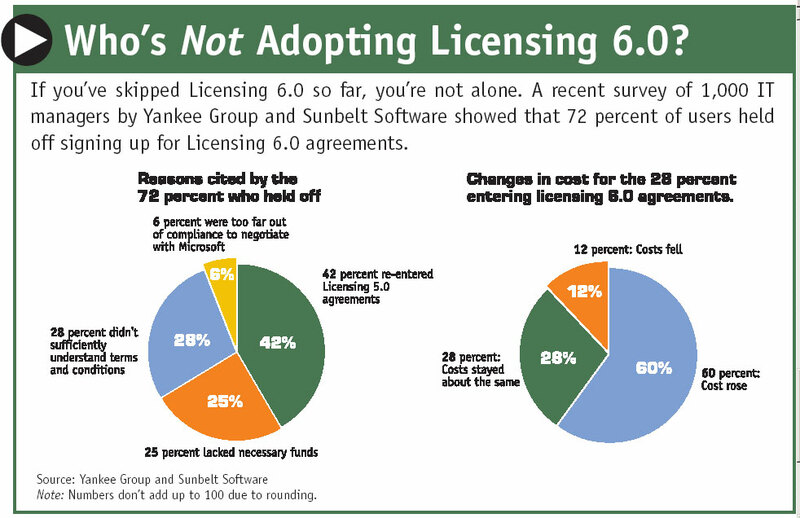 For those who re-entered Licensing 5.0 agreements shortly after Licensing 6.0 was announced in the spring of 2001, those who let licensing agreements expire, or those who just avoided signing an agreement altogether, it’s time to look at changes to Licensing 6.0 and figure out if the new options mean the program is a better fit. Until a few months ago, Microsoft had avoided publicly making major changes to Licensing 6.0 for fear of reigniting the firestorm of protests that accompanied the original announcement and prompted the licensing program to be delayed twice. Nonetheless, Microsoft stealthily made several changes to the program that have gone into effect already. For those willing to consider Windows Server 2003, Client Access Licenses are now much more flexible with two options that can be mixed and matched to allow a customer to craft the least costly deal. Organizations with fewer than 250 seats now can choose to enter agreements that allow them to pay for their software over three years, rather than paying for everything up front. Users of very large Windows server systems now have an option to pay for Windows Server System software on a per-processor basis only for the processors they use. Subtle contract changes tilt the balance further in the customers’, rather than Microsoft’s, favor. But in late May, Microsoft publicly acknowledged it hasn’t been communicating changes clearly enough and that it hadn’t provided enough value in Software Assurance, the upgrade-right component of Microsoft volume license agreements. When Microsoft implemented Licensing 6.0, the company eliminated several popular upgrade options in favor of the subscription-like Software Assurance model, which has customers pay a percentage of the software’s cost every year. The annual SA charge works out to about 25 percent of the cost of server software and 29 percent of desktop applications and operating systems. To compensate, Microsoft added several freebies to Software Assurance, which are retroactive if you’ve already signed up. Free technical support for Software Assurance customers during regular business hours and Web-based technical support. Employee home-use rights for Office System products. Given all these changes, is Licensing 6.0 right for your organization now? Check out the details of each change below, and remember that substantial obstacles in Microsoft’s business model prevent you from precisely assessing whether or not the economics of Licensing 6.0 work for you. The primary problem is that Microsoft refuses to publish future product roadmaps. Without firm delivery dates, it’ll always be difficult to determine if you’ll get your money’s worth from Software Assurance. Lack of enhanced support for Software Assurance subscribers was one of the most glaring holes of the previous Microsoft agreements. Throwing that support in for Software Assurance customers and some other Licensing 6.0 customers is a substantial value and that, on its own, makes the whole program worth re-evaluating. Support will come in several forms. For server software, Microsoft is offering free, new Web-based support for standard edition software. For enterprise editions, customers can call during regular business hours for problem resolution. Some exclusions exist so, as always, you have to read the fine print and make sure the program applies to your specific license agreement. Microsoft has also preserved a role for its premier support, by reserving that program for 24/7 telephone support. Other new support offerings include a new TechNet Online Concierge service for Licensing 6.0 customers featuring a live person helping customers via Web chats to find Knowledge Base articles and other appropriate material. Software Assurance customers now also qualify for Extended Lifecycle Hotfix Support, the program for customers needing some Microsoft engineering magic for software that’s gone beyond the five-year standard support window. This one will make you popular with your users and represents a financial concession for Microsoft. If you sign up for a Software Assurance agreement, your users have the right to install their licensed work versions of Office System products at home. The deal applies not just to the standard Office components like Word, Excel and PowerPoint but to the entire family of products, including Access, FrontPage, InfoPath, OneNote, Project Standard 2002, Publisher and Visio. Consider the potential productivity boost for information workers, and suddenly Software Assurance looks a lot better than it used to. Some categories of Licensing 6.0 customers also have an option to allow their employees to purchase Microsoft software for their homes at a corporate discount, providing a potential productivity boost at the same time as it gives the company a perk to offer employees. Microsoft is developing e-Training courses that will be offered free to administrators and end users working for Licensing 6.0 customer companies. The courses will cover both new server and desktop technologies. Microsoft will also offer vouchers to most of its Software Assurance customers that can be used for training at Certified Technical Education Centers. Licensing Poll. Cliick image to view larger version. While the support, home-use and training provisions are coming next month, several changes to Licensing 6.0 are here now. There are new Client Access License options for Windows 2003 that give you more power to match CALs to your needs. If you’re comfortable deploying a brand-spanking-new operating system, Windows 2003 brings licensing changes worth checking out. A new per-user CAL option exists for connecting to a Windows 2003 server. Microsoft chose to add this option to the existing per-device CAL, rather than simply replacing the per-device CAL. It was a commendable decision. Windows servers have traditionally had the per-device option, also known as per-seat licensing. Microsoft was pressured to expand its CAL options by customers who have more devices than users. The new per-user option allows companies with employees who connect to the server from multiple personal devices to require just one CAL. Conversely, companies with common terminals accessed by several users can still opt for the per-device option. Customers can also choose a mix of per-user and per-device CALs to produce the lowest possible cost. The only drawback is that you may need to pull out your old high-school algebra texts to figure out your most cost-effective ratio. This became an option for North American customers in March. If yours is among the majority of companies that haven’t migrated to Licensing 6.0, and you have between five and 250 seats, this may be the option for you. It’s called Open License Value 6.0. Microsoft classifies Open License Value as part of the Open License 6.0 family of license options. The program is designed for organizations with between five and 250 desktops, like Open License 6.0. The key difference is that Open License Value gives users a choice of paying up front, the only option for Open License 6.0, or spreading payments annually over three years. The annualized payments make the program similar to the Select License 6.0 and Enterprise Agreement 6.0 contracts for large customers with more than 250 desktops. Open License Value also automatically includes Software Assurance, which distinguishes it from the other Open License programs, in which Software Assurance is merely an option. Microsoft showed some flexibility in the licensing of its back-end server products, although this affects a relatively small set of high-end customers. It’s now allowing customers who want to use the per-processor licensing option for products like SQL Server to pay only for the number of processors they actually use within a larger system, rather than pay for all the processors in the system. The only really surprising thing about this common-sense change is that it needed to be made at all. In another positive, common-sense change, Microsoft created an upgrade path for customers wanting to promote a standard edition server to enterprise edition. Now, Software Assurance customers with a standard edition of Windows, SQL, Exchange or other Microsoft servers can upgrade to the enterprise edition without buying a new license. The cost amounts to the difference between the cost of the standard and enterprise editions plus the difference between the cost of Software Assurance for the two editions. The payment is spread over the remaining life of the original Software Assurance agreement. Still in the dark about Licensing 6.0 fundamentals? You’re not alone. Here’s a crash course. The program comes in five major flavors, listed below. A key element is Software Assurance. It’s included in some programs and is an option in others. Software Assurance is the upgrade protection in Licensing 6.0 that guarantees that if a new version of Windows or Office comes out, you can move your desktops to it without paying any more money (than you’ve already paid). This is the simplest program to use and understand, and it’s designed for the smallest customers. Any customer with five or more PCs can enroll in the Open License 6.0 program. Unlike all the other Licensing 6.0 programs, which last three years, this program lasts for two years. During that period, customers can continue buying on the same authorization number, which means you might be able to get bigger discounts as you go. Software Assurance is an option in Open License 6.0. There are two categories of Open License 6.0. Open Business gives volume pricing with minimum license requirements, and Open Volume offers a bigger discount for a larger up-front order. This new program also applies to smaller customers with five or more desktops. Software Assurance is automatically included. But where the Open License 6.0 program requires full up-front payment, Open License Value 6.0 customers can spread their payments over the three-year life of the contract. This is the first of the programs for companies with at least 250 PCs. Annualized payments spread over three years are an option for customers who select Software Assurance. The program is designed for customers with more specialized needs than the Enterprise Agreement options below. A complicated point system covering three different “pools” of Microsoft software (applications, systems and servers) determines discount levels. This is the option designed for companies with at least 250 PCs and the willingness to standardize Microsoft infrastructures and centralize purchasing. Software Assurance is included. Price levels are based on the number of qualified desktops in an enterprise. This program is similar to the Enterprise Agreement program in most respects except that it’s a lease program rather than a purchase program. This means that if you don’t renew when your three years are up, you don’t have the right to use any of the software anymore. At lease expiration, customers can buy the software outright or renew the lease. Another significant difference is that there’s a 15-percent discount compared to Enterprise Agreement prices. Microsoft has run into significant problems over contract wording since rolling out Licensing 6.0. There have also been subtle changes to contract wording in the last half year to speed negotiations and shift the burden from customers to Microsoft. One example is a change in the length of the product warranty from 90 days to one year, removing an immediate red flag for lawyers reviewing the contracts. While nearly all the changes have been positive, Microsoft’s licensing program still poses significant problems. The biggest is that Microsoft doesn’t publish a product roadmap, making it difficult to calculate whether Software Assurance will save money over the life of the agreement. If you don’t know whether the next Windows desktop is coming out in 2004 or 2006, it’s hard to tell if you’ll get the upgrade you paid for with Software Assurance before that contract expires. Industry analysts say Microsoft has also undercut the value of Licensing 6.0 in the last year in several ways. For one thing, Microsoft published a product- support lifecycle policy that lays out, product by product, the exact date that support will expire. This product support roadmap is an unmitigated good thing for Microsoft customers. Such clarity makes it much easier to skip releases. If you know Windows XP Professional support will last until Dec. 31, 2008, you can be less concerned about being stuck with an unsupported operating system in early 2006. That makes you less likely to be frightened into buying Software Assurance. At the same time, Microsoft slipped from an aggressive Windows release schedule that, among other things, would have seen what is now Windows 2003 out the door in early 2002. Continual slips from unofficial release schedules make it harder to justify committing to a Software Assurance-style agreement. Despite the ambiguities, it’s possible to muddle to some conclusions about whether or not Licensing 6.0 is a good move for your organization. While it’s hard to pinpoint the month that a major Microsoft release will come out, it’s usually possible to guess within a period of 18 months or so. As long as you can fit that 18-month window squarely into a three-year agreement, you can be relatively sure you’ll get the upgrade you want. In any case, the sustained opposition to Microsoft’s licensing program has resulted in one good thing: More choices. The program looks substantially better for customers this year than it did a year ago, and the situation may continue to improve.